Ok I admit it...I love scrap booking. With 2 kids creating these albums for us to have and enjoy means a lot to me. Also it taps into another aspect of my creativity. What I don't like about scrap booking is how it adds to the consumerism mentality that takes place here in the USA. You could spend a small fortune on all the stickers, papers, embellishments etc that line aisle after aisle of your local craft store. It's actually hard to resist. 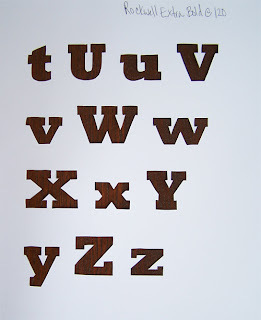 But as I walked the aisles myself yesterday looking for a stencil of the alphabet I couldn't bare to spend $13 dollars on one alphabet. So I came home empty handed and during the drive it hit me...I should make my own stencil. And so I did. Yes, it won't last forever...but are you really going to want to use the same font of an alphabet forever anyhow? And when your done just throw it in the recycling can. 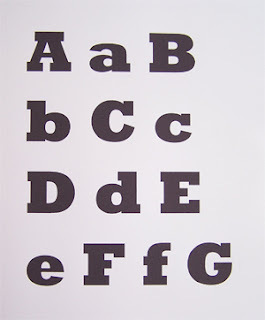 I printed out the alphabet ( Rockwell Extra Bold at 120) on heavy duty card stock and cut out each letter with an exacto knife. This part takes time but after you cut out a few letters your mind begins to clear and you reach a zen state of mentality. It's glorious! And now I have a stencil that I can trace letters for my title on each layout.